Diagnostic imaging tests and scans are important for accurately diagnosing and staging cancer, as well as tracking the progress of treatment. 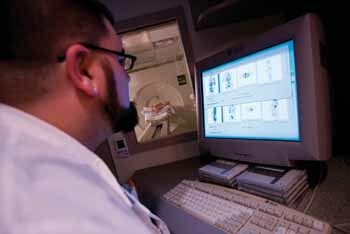 Our in-office imaging center provides the most advanced imaging services available. 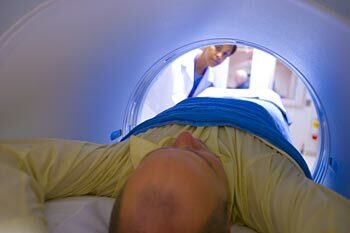 From Positron Emission Tomography (PET) and Computed Tomography (CT) to combination PET/CT scans, you can schedule and receive the tests and scans required for your personalized care. CT Simulation enhances radiation treatment planning by generating three-dimensional images for utmost accuracy in targeting and mapping specific treatment areas. With CT Simulation, oncologists can deliver high doses of radiation to a tumor, while minimizing the amount of radiation to normal, surrounding tissues. Treatment planning is enhanced with the use of a three-dimensional treatment planning computer. 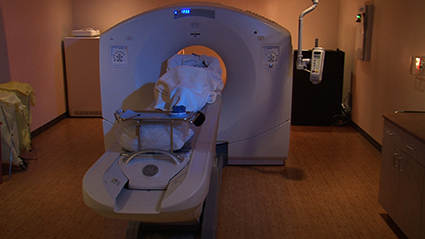 Using the information and images provided by the CT Simulator, the computer generates a treatment plan tailored to the patient's cancer care needs. Guided by three-dimensional models, the physician, physicist and dosimetrist can accurately determine the most effective dose of radiation to be delivered during treatment. A PET/CT scan combines two powerful imaging modalities into one of the most advanced medical imaging tools available. While Positron Emission Tomography (PET) shows a body’s metabolic activity, Computed Tomography (CT) shows anatomy. When brought together, the PET and CT scans show your body’s metabolic pattern, including the presence of both normal and abnormal tissue activity (tumor), and reveals detailed anatomical information of the area where the normal or abnormal activity is taking place. Positron Emission Tomography (PET) is a sophisticated camera that takes pictures of your body’s cells, producing powerful images and information unobtainable by other imaging modalities like CT and MRI (Magnetic Resonance Imaging). It is used to diagnose and guide the treatment of a number of diseases including cancer, coronary disease and neurological problems such as seizure disorders. A PET scan shows how your body’s cells use a simple sugar, glucose, as a source of energy. Prior to the scan, a patient will be injected with a safe, effective substance called a tracer that emits signals to the PET scanner as it journeys through your body. A computer assembles these signals into images that reveal how much glucose is being metabolized in different areas of the body. Cancer cells grow faster and use more energy or glucose than normal cells, and this increased activity will be displayed on a PET scan. Physicians can use the information to detect cancer, determine the best methods for treatment, as well as check the effectiveness of treatments. Sodium Fluoride PET/CT studies are available at all of our PET/CT locations. This new, state-of-the-art technology is superior to conventional bone scans and is specifically designed for detecting bone metastases. The combination of PET and CT often gives physicians the most accurate information for identifying the precise location of the disease and prescribing the right treatment, such as surgery, chemotherapy or radiation therapy. PET scans have proven to be highly accurate in showing the presence or spread of many malignant tumors. For example, PET is believed to be more accurate than other imaging methods currently available in detecting the spread of lung and colon cancers. PET is also used with a high degree of accuracy in evaluating recurrent breast cancer, melanoma, lymphoma, ovarian cancer, brain cancer, esophageal cancer and tumors of the head and neck. A PET scan requires no surgery, is painless and can be performed in just a few hours as an outpatient procedure. When information from PET and CT scans is integrated, it can be used with a high degree of confidence to detect, localize and assess the stage of a variety of cancers. A PET/CT scan is often used to detect breast, esophageal, cervical, melanoma, lymphoma, lung, colorectal, head and neck, and ovarian cancers.